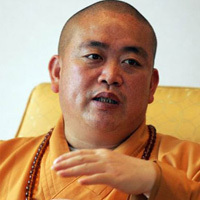 Shi Yongxin (Chinese: 释永信; Pinyin: Shì Yǒngxìn) is the current principal abbot of the Shaolin Temple. He is the thirteenth successor after Buddhist abbot Xue Ting Fu Yu. Yongxin is not a martial abbot, but a clerical one, and his duties are scholarly; martial abbot Shi De Li is responsible for training monks at the Shaolin Temple. Liu Yingcheng was born into a devout Buddhist family in 1965. A quiet and intelligent child, he was enlightened and drawn to Buddhism at a very young age. In 1981, his parents granted his wish by sending him to Shaolin Temple where he became a monk and acquired the Buddhist name of Shi Yongxin. Young Yongxin was personally mentored by the Temple’s Abbot Shi Xingzheng. He studied diligently and dedicated himself in attending to his mentor while undergoing remarkable personal growth in character and wisdom. He later furthered his studies at Yunju Mountain in Jiangxi Province, Jiuhua Mountain in Anhui Province and Guangji Temple in Beijing. Upon his return to the Temple in 1984, he resumed his duties as the Abbot’s assistant. He was elected a member of the newly formed Shaolin Temple Democratic Management Committee, and assisted the Abbot in running the Temple’s daily operations. In September the same year at nineteen years of age, Shi Yongxin was fully ordained at Xipu Temple in Jiangxi Province. Young Master Shi Yongxini had grand visions for Shaolin Temple. His mission was to reinvigorate Shaolin Temple—the birth place of Ch’an Buddhism and to propagate Shaolin culture on a far reaching scale. He has since made many invaluable contributions in the revival, preservation and elevation of the Shaolin legacy. 1986: Organized manpower and resources to unearth, compile and publish the Shaolin kung fu classics; founded Society for the Studies of Shaolin Fist Forms and served as Vice Chair. 1987: Established and served as Director of the Shaolin Wushu Team, predecessor of world famous Shaolin Temple Kung Fu Monks Corps. 1987.08: At the passing of Abbot Shi Xingzheng, Master Yongxin inherited his mentor’s mantle and assumed responsibilities as Chief Executive of Shaolin Temple Management Committee. Besides overall management of the Temple including the daily operations, receiving visitors and making foreign trips, he also took over renovation projects for the Temple Hall, the Bell Tower and the Drum Tower, personally attending to tasks from researching and compiling firsthand information to funding sources. 1987.10: Elected Standing Committee member of Henan Province Buddhist Association. 1988.02: Founded Shaolin Red Cross, to provide relief to ailing residents in the surrounding areas of Shaolin Temple. 1988.10: Founded Shaolin Calligraphy and Art Institute. 1989.06: Led the Shaolin Kung Fu Monks Corps on a national performing tour to promote Shaolin culture, and gave a benefit performance to raise funds for building giant statues of Yandi and Huangdi (two famous tribal leaders in ancient Chinese history dating back 6,000 years) in the Yellow River tourist district. 1993.03: Elected Member of the Henan Province Political Consultative Conference. 1993.05: Founded China Ch’an Poetry Society, publishes Ch’an Poetry annual collections. 1993.06: At the invitation of Taiwan’s Chinese Culture University, led a Shaolin Temple Buddhist Culture Delegation to Taiwan. Held Buddhist masses with eminent monks such as Wuming. Received by prominent personalities including Yu Dawei, Jiang Jingguo and Hao Bochuan. This trip was especially significant because it was the first time a Buddhist delegation from the Chinese mainland visited Taiwan after forty years of separation between the Buddhists on both sides of the Taiwan Strait. The visit was a great sensation generating tremendous interest and lasting impact on the island. 1993.10: Elected Member of China Buddhist Association’s Board of Directors. 1994.02: Founded Shaolin Benevolent Foundation and served as Chair. The Foundation actively conducted poverty and disaster relief campaigns, including; benefit performances for Project Hope; establishing Shaolin Children’s Home to care for 1,000 orphans; providing periodic assistance to send underprivileged children to school; drilling deep wells for villages in need of water source; delivering food to Impoverished ethnic minority villages, providing supplies to medical facilities in indigent villages; organizing volunteer medical teams touring the province to provide care and treatment to the needy, providing financial assistance to academic organizations; and contributing relief funds and materials to flood disaster areas. These activities were much appreciated and applauded by relevant government agencies and the public at large. 1995.09: Planned, implemented and hosted Shaolin Temple’s 1,500 Anniversary Celebration. This large scale Buddhist assembly was an unprecedented grand occasion attended by thousands of Shaolin disciples and numerous distinguished guests from all over the world. This event contributed greatly to promoting Shaolin culture in a wider scope and deeper level. 1996.05: Published the inaugural issue of Ch’an Lu magazine. 1998.03: Elected Deputy of the 9th National People’s Congress of the People of Chinas. 1998.07: Elected Chairman of Henan Province Buddhist Association. 1999: Founded Shaolin Culture Research Institute with the mission to advance the level of academic research in Shaolin culture. 1999.08: Officially inaugurated as Abbot of China Songshan Shaolin Temple. November 1999: At the invitation of Buckingham Palace of the United Kingdom, led Shaolin Kung Fu Monks Delegation to participate in the 99 Royal Variety Show. Delegation was received by Queen Elizabeth II. The trip represented an important step that Chinese culture has taken into the western world’s mainstream. From 2001: Tirelessly works to accomplish his mission to acquire UNESCO (United Nations Educational, Scientific and Cultural Organization) world cultural heritage status for Shaolin Temple and Shaolin Kung Fu. Actively assists the local government’s relocation efforts in clearing undue clutters from the surrounding area of Shaolin Temple. 2003.03: Headed the Songshan Shaolin Kung Fu Monks Delegation to the Sino-Japanese diplomatic relations celebration, as part of the entourage of Li Peng, Standing Committee Chair of the National People’s Congress. Shaolin Kung Fu was featured in a showcase performance. 2003.08: Launched “shaolin.org.cn,” Shaolin Temple’s official website. 2003.09: Elected Vice Chair of China Buddhist Association. 2003.10: Visited former International Olympics Committee Chair Juan Antonio Samaranch in Spain to promote including Chinese Kung Fu as an Olympic sport. 2004.03: Led a Shaolin Culture Delegation to California, USA to participate in the Proclamation of “China Songshan Shaolin Temple Day” on March 21. 2004.11: Led the Shaolin Temple Kung Fu Monks Delegation and visited St. Paul of Brazil, as part of Chinese President Hu Jintao’s entourage in an official visit to South America. Shaolin Kung Fu was showcased in an Experience China cultural exchange extravaganza. From 2004.02 to present: Provides leadership in restoring the original Buddhist cultural space in Shaolin Temple, to create suitable environments for the monks’ religious practices and to protect Shaolin culture.